Cushion Halo Diamond Platinum Engagement Ring | Shane Co. This beautiful engagement ring displays a classic and simple style with a polish finished band while the halo at the top is full of glamorous allure from pavé-set round diamonds. A total of 14 round diamonds, at approximately .41 carat total weight, are displayed in both the halo and bezel-set on the profiles of the ring. This ring measures 3.5mm wide, is crafted of superior quality platinum and waits to be completed by the center 1.00 carat diamond of your choice. 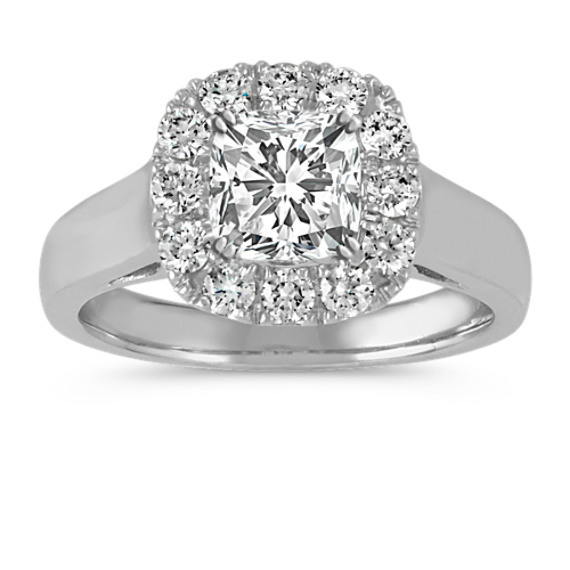 Popular center diamond choices for this setting include round, cushion cut, and princess cut.